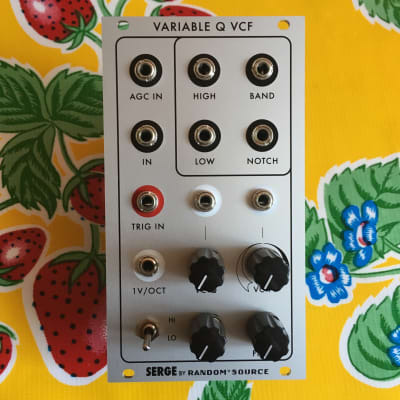 The Variable Q VCF (or VCFQ, for short) from Random Source is a skiff-friendly Eurorack adaptation of what is perhaps the most famous Serge filter. It is an effortlessly thick and colorful 12dB/oct multimode filter with ultra-smooth resonance that never ceases to amaze. Amazing tonal variety comes from combining outputs, automating resonance settings via CV, and adding grit using its adjustable-gain input. Simple filtration is only one of the VCFQ's many uses, however. Its amazing trigger input turns rising-edge pulses into thick analog kicks and toms which roughly track notes thanks to a dedicated 1V/oct input. This module also becomes an ultra-powerful modulator in "Lo" mode, with decaying/syncable LFOs well within grasp using the trigger input, along with free-running oscillation when self-patched. When fed stepped sequences, sample and hold, or other LFOs, the VCFQ can even function as an effective slew limiter. And that's not all: for those lucky enough to own two VCFQs, dual-peak resonance and an ultra-thick 24dB/oct low-pass mode offer some of the most rewarding synth sounds in existence. In short, adding a VCFQ to one's Eurorack system is always worthwhile.